This was a ride I’ve had floating about my head for years and never got round to. 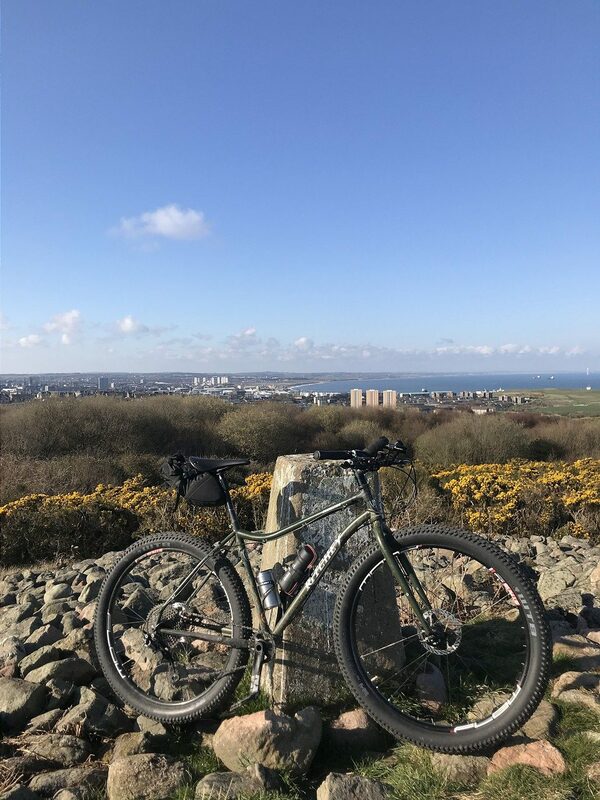 In the past, I would have thought of this a day’s ride, but I decided to ride my mountain bike in to work on a sunny Tuesday and get cracking straight from there. 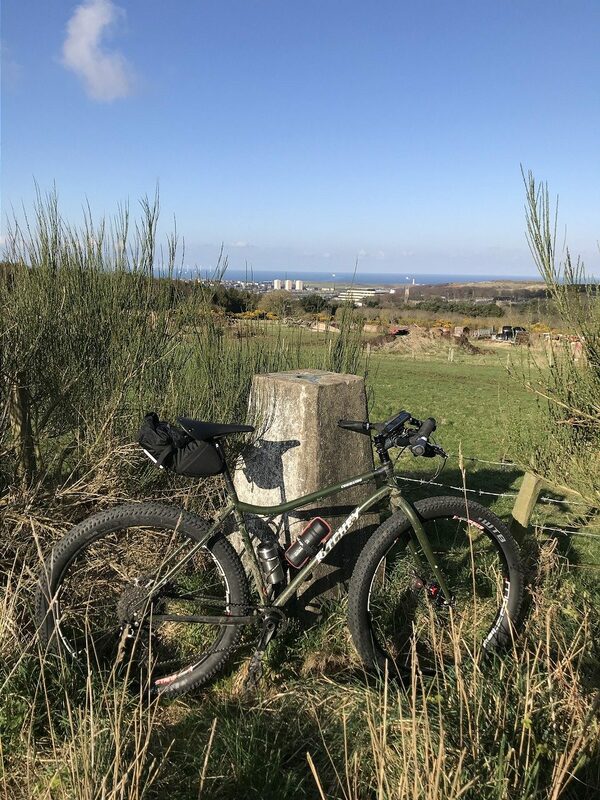 The plan was simple – ride to the top of the 7 biggest hills close to Aberdeen and get a picture of my bike at each trig point. 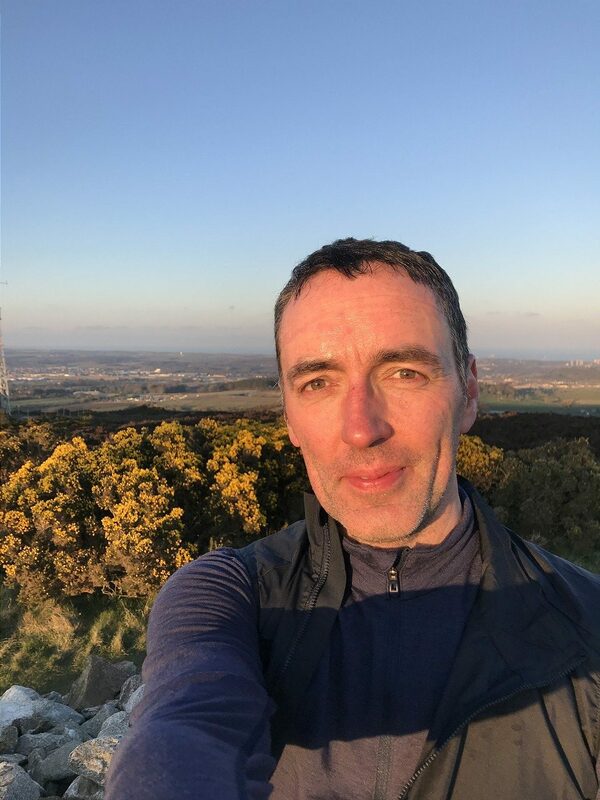 My first target was Tullos Hill, which is approximately 5 minutes from work, reached by following a steep gravelly path straight up the side of the hill to the highest cairn of several, this one topped with a trig point, giving views North over the city and the sea to the East. 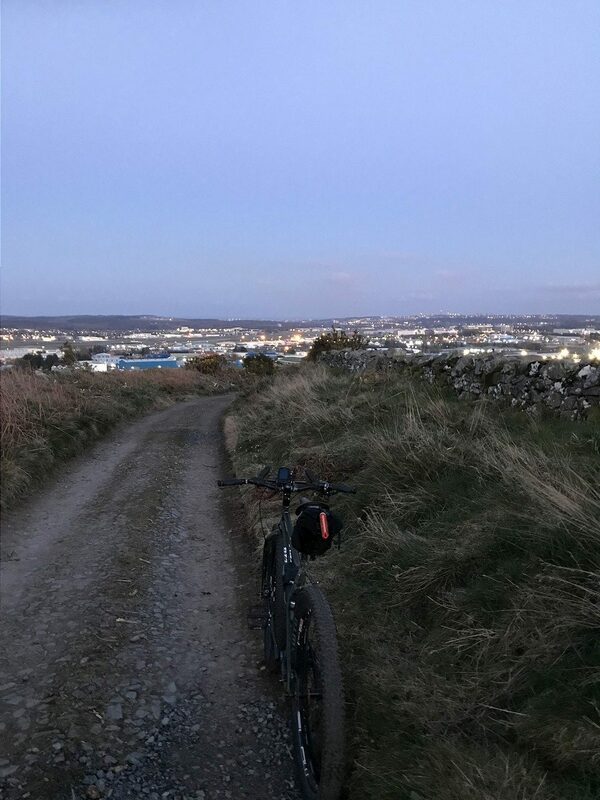 From the top, it was a quick ride along the top, before dropping down behind the Shell buildings and crossing the main road to reach the entrance to Kincorth Hill nature reserve. 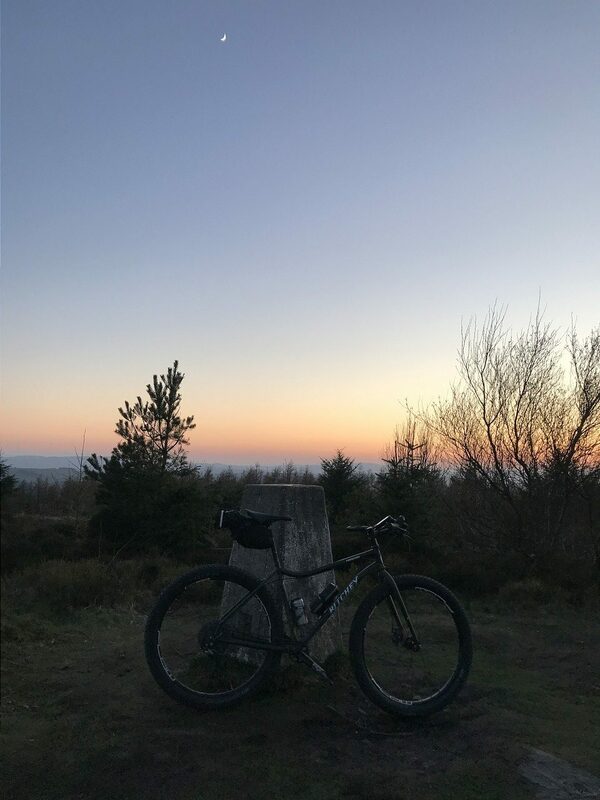 A few minutes later, I turned off the main gravel track and followed the line of fence to take me to the hidden trig point. Two hills down in short order, but I had to cover a bit of distance to reach the next. 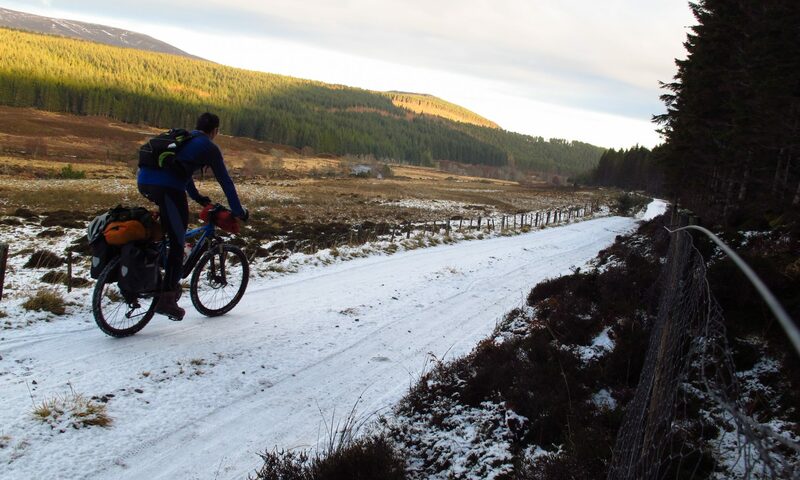 I flew down to the end of the hill, then crossed the River Dee and climbed up to the Deeside Railway Line, which I followed for a few miles to get me within range of hill number three. 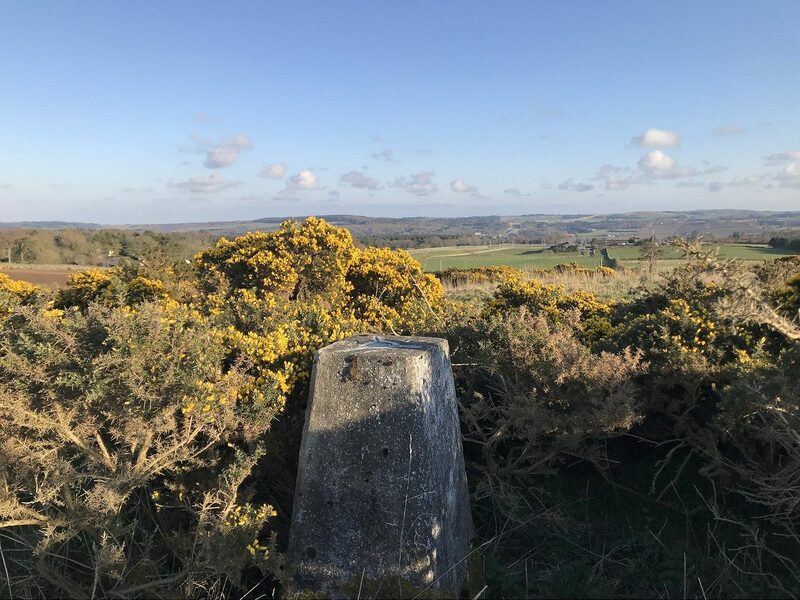 I turned off and started climbing up back roads and farm tracks, reaching a field entrance which my aerial reconnaissance told me contained a trig point at the top corner. 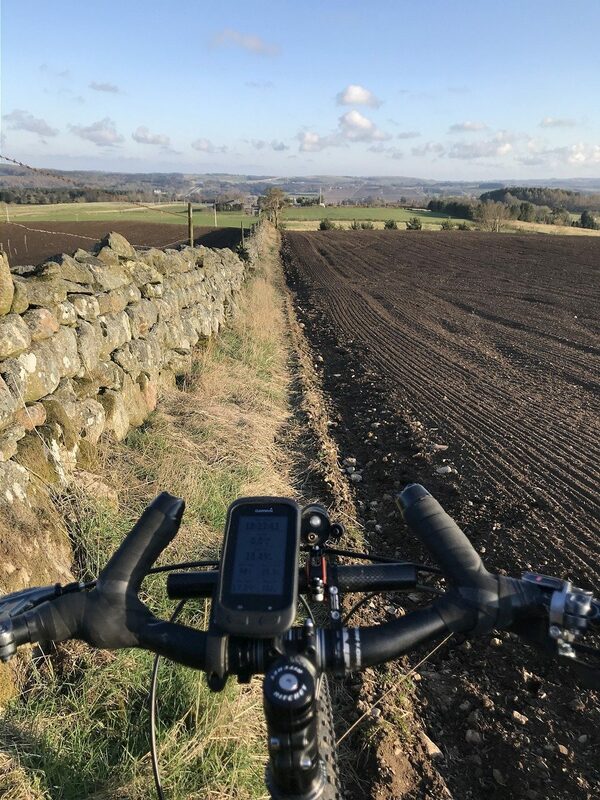 I pushed my bike up the verge so as not to disturb the freshly sown soil, got to the top of the wall and started looking for the Contlaw Hill trig point. This was the only summit I wasn’t sure about finding, so I rolled back down the field edge to take the handy farm track that linked across towards Countesswells and start another very familiar climb up to the top of Kingshill Wood. The trig here is tucked away in the trees behind the small water reservoir. Now, I wanted to try a new way off the hill that would deposit me right by Kingswells. I stopped in the warm sun and ate a packet of crisps from the vending machine in work and drank some tea from my insulated mug. 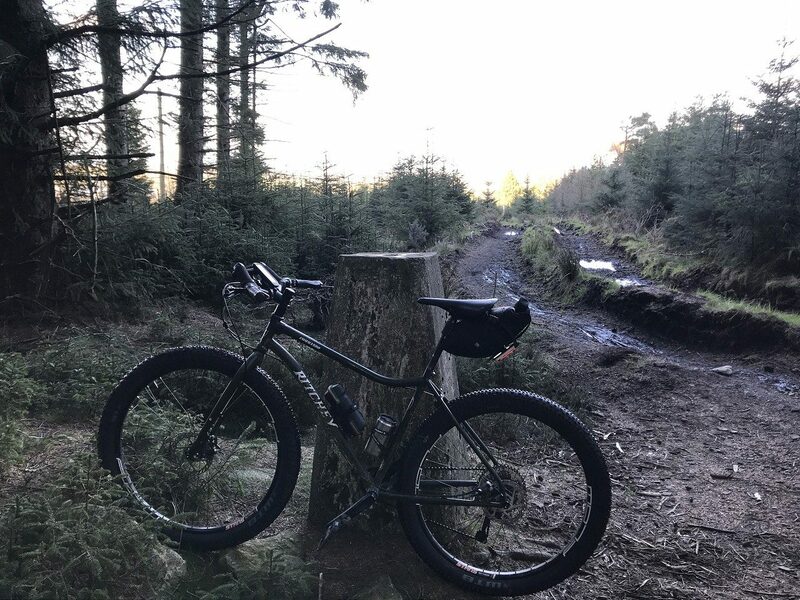 There was a sneaky wee trail off the main path here that weaved through some young pines before a steep downhill to a field boundary, which could be hopped over before riding down a grassy field to rejoin a track to the main road. 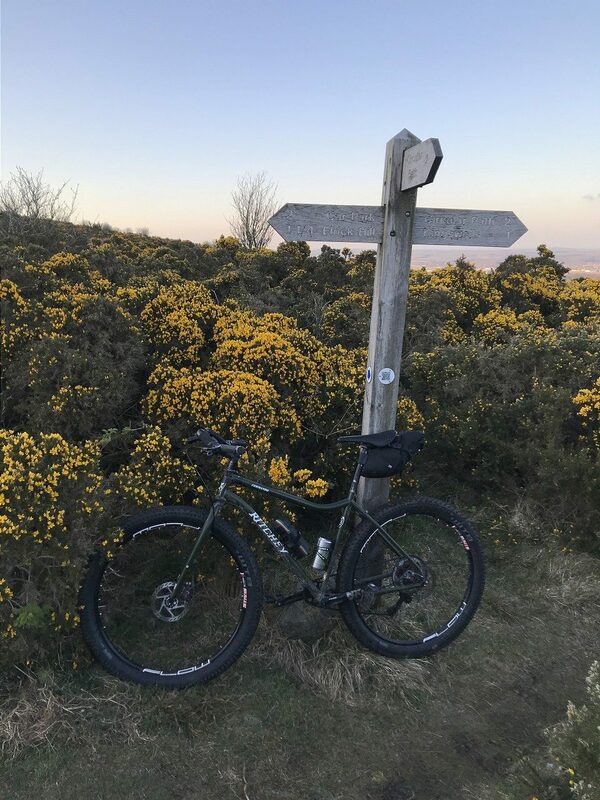 Next, I headed across to Kingswells and used its extensive network of off road paths to make my way through to the far end of the town and onto my chosen route up Brimmond Hill. There was a spanking new bridge over the AWPR before I turned off into the trees for narrow rooty singletrack riding, eventually emerging onto to the steeper hill paths. The last time I had been this side of the hill was about 14 years ago and the gorse had been above head height with no gaps between, so I had forced my way down from the top and come out well and truly perforated. Nowadays, the paths are much more well looked after, so I could concentrate on the challenge of riding up the hill! The light up top was amazing – even the unsightly communications towers couldn’t take away from it. 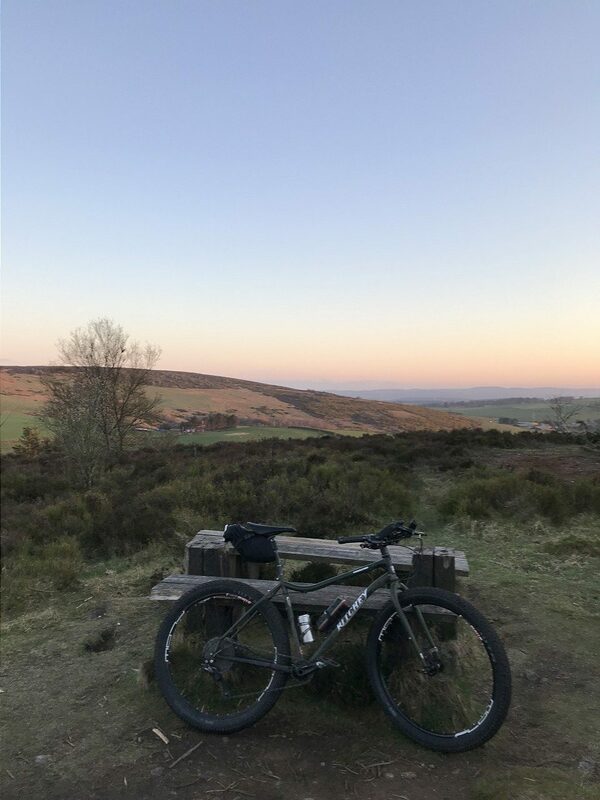 I dwelled for a wee while and took a few photos, but I needed to keep moving so that I didn’t miss the last of the light for the next two hills. Off I shot, down the tarmac service road and through the gate at the bottom, crossing the road and nipping through a gap in the treeline. The path here followed the edge of the golf course, taking me down to a burn crossing, where I swung left after the bridge and contoured around Elrick Hill on a rooty, rocky path. I humphed my way up the last steep stretch to the top of the hill and emerged into a clearing with several rustic picnic benches, which looked to have been pillaged for firewood by ne’er do wells. This was the only hill without a trig point, so I had to rely on a bench for my summit shot. 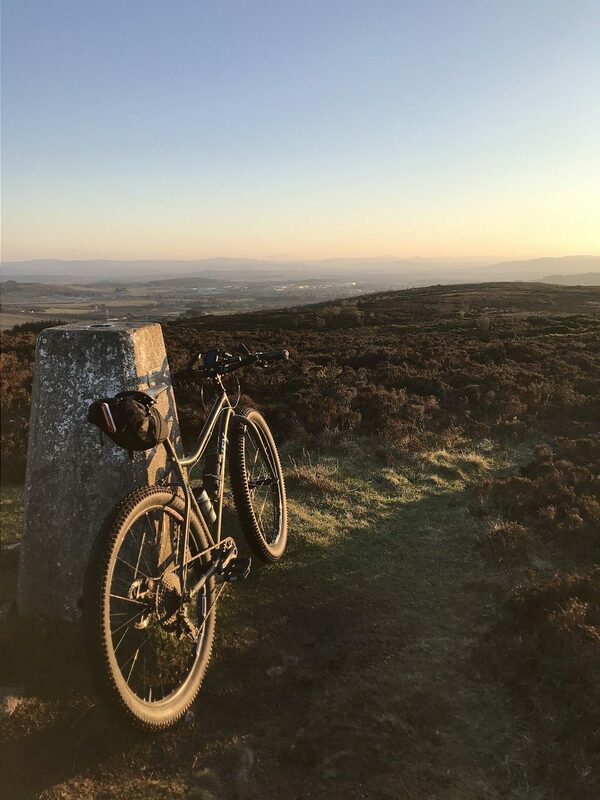 There was a nice rocky singletrack descent through the heather off the top of the hill, where it was hard not to stop and enjoy the sunset. Unfortunately, I had places to be, so I took a couple of pictures before moving on. 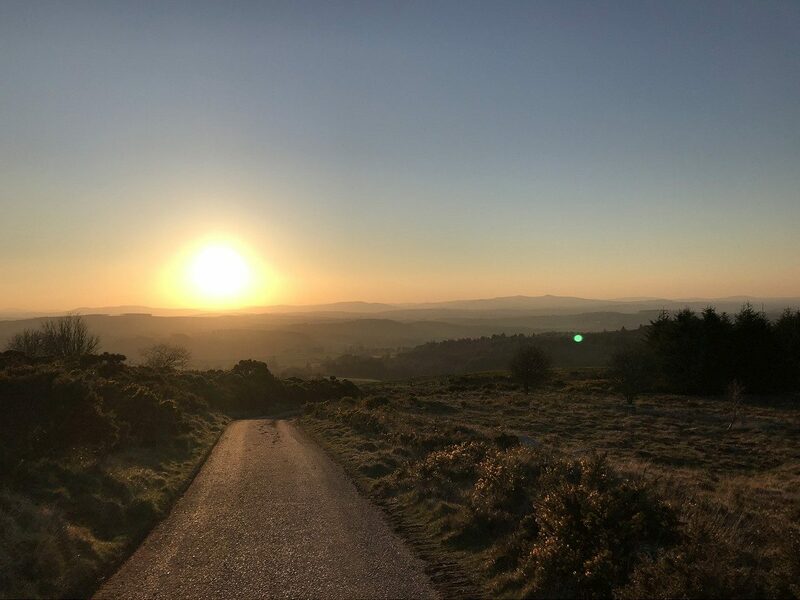 Before long, I was down at the Tyrebagger carpark and rejoined the road to cross the A90 at a sprint before any cars bore down on me at the Kirkhill turn off. 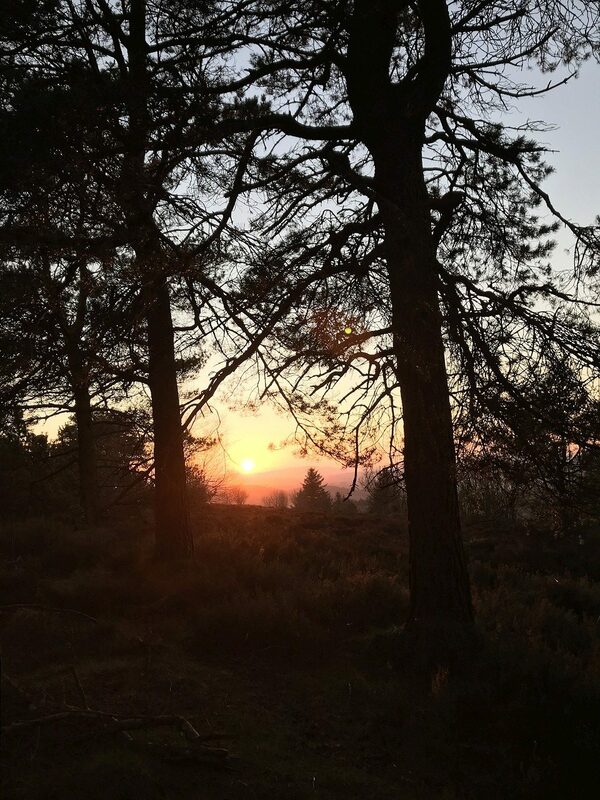 I rumbled along the firm forestry tracks on my old regular running route and after a couple of brisk climbs took the final trail up to the Tappie Tower for my seventh summit shots. A long-held mission accomplished, I bumped my way down off the hill and whizzed round on the forestry tracks to yet another new AWPR crossing. 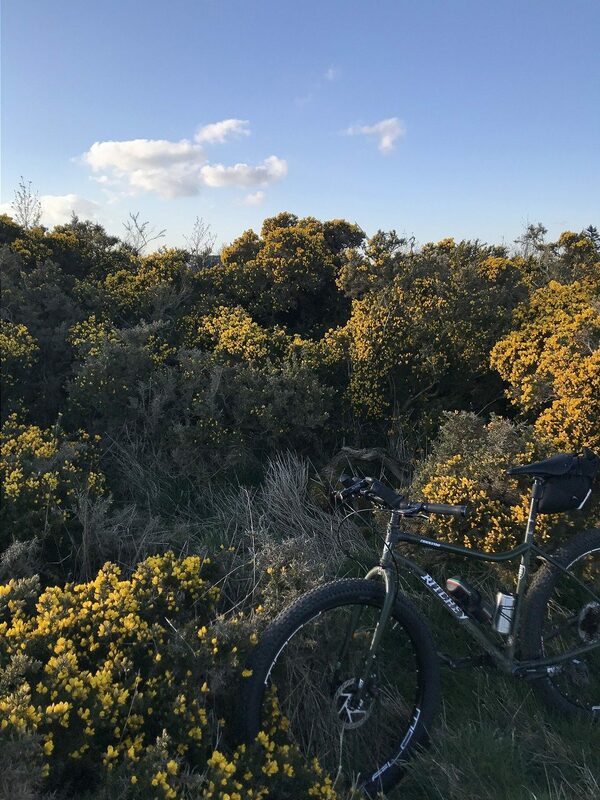 This deposited me on farm tracks above Dyce and I dropped down to the airport road, before nipping through the agricultural college on a new route for me. I added a couple more layers, as the temperature had plummeted and then cruised along a mix of more farm and park tracks to get me back home for dinner.